Thirteen-year-old Bobby Thomas knows the $50 million Everything League grand prize is way out of his reach. His game time is limited to library hours, and he hasn’t had a chance to build up his skills as a player. Instead, he spends his time as a grunt — one of the bad guys who make the game more challenging — and finds himself grunting, unnoticed, against some of the most skilled players. But the more Bobby plays against top players, the more he begins to suspect the competition is rigged. And when the dangers of the virtual world start spilling into reality, Bobby, working with Everything League programmer Amanda, must unmask the cheater before he and his friends suffer a real-life game over. Virtual Grunt is a middle-grade sci-fi novel that takes gaming to the next level. Readers who like fast-paced action, futuristic gaming, and heroic underdogs will love Barnaby Quirk’s virtual adventure. 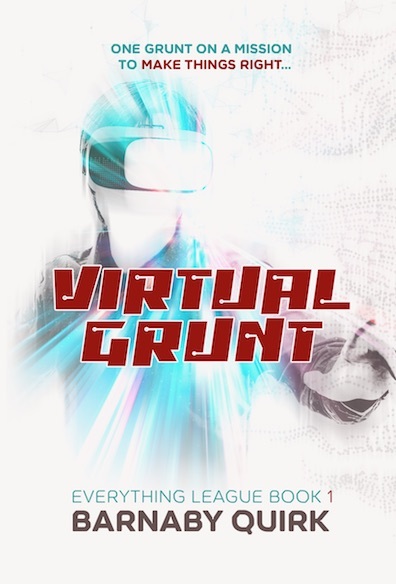 Get Virtual Grunt from your local bookstore, Amazon, and wherever ebooks are sold.